Proper risk management and estate planning for individuals and companies should include life insurance solutions that are appropriate for each client’s unique set of circumstances. Our financial professionals have been providing effective life insurance solutions to families and businesses for over five decades, and we can help identify and execute the right plan for you. 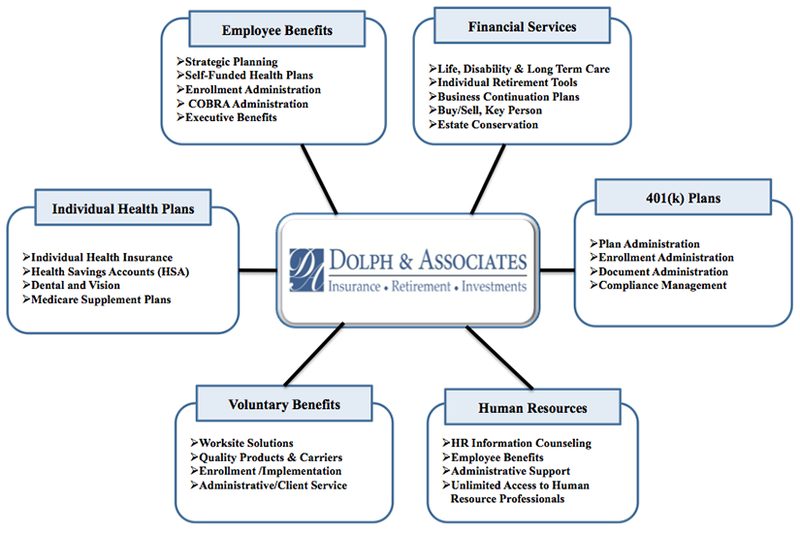 Dolph & Associates work closely with client Finance and Human Resource leaders to establish plan designs which are both cost effective and supportive of our client's goals. We continually evaluate the impact of plan funding and employee contributions to ensure corporate budget constraints are always in the forefront. We market client programs to ensure greatest value is being received and that risk is managed in accordance with our client's objective. The success of most businesses is tied into the talent, passion and work ethics of their key executives. Executive benefit packages can help you attract, motivate, and retain high-caliber employees and keep your company healthy and stable. We can help you with non-qualified plans, supplemental employee retirement plans, split dollar plans, and more. Key person life insurance offers a death benefit that indemnifies an employer for the loss of one of its most important assets - the key person. This can help assure continuity of the business for employees, customers and creditors, and protects against losses in sales, momentum, and credit. It can also be used to recruit and develop a replacement for the employee. A buy–sell agreement is a legally binding agreement between co-owners of a business that governs the situation if a co-owner dies or leaves the business, whether by force or by choice. A funded cross-purchase buy-sell plan utilizes life insurance to ensure that the arrangement is properly funded so that there will be money when the event is triggered.